We start off our "summer" with a fabulous day trip to the Thousand Islands region of Ontario. Join us for our day of breathtaking scenery, sunshine, fresh air, the 1000 islands and then tours of two sites that are significant icons in the history of our country. 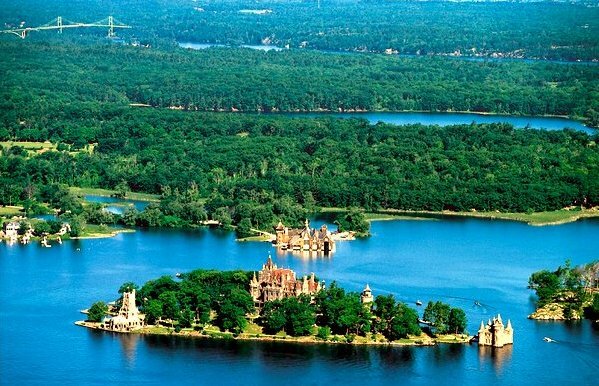 Our day begins with a cruise through the 1000 Islands that cruises past Boldt Castle, the 1000 Islands International Bridge, Zavicon Island and the homes of the rich and famous. Lunch on board the cruise is included. Bask in the sunshine on the upper deck and enjoy the fresh air and scenic beauty of the islands as you enjoy your boxed lunch. This is followed by a visit to historic Fort Henry in Kingston. You have an opportunity to experience the garrison parade at Fort Henry followed by a guided tour of the extensive grounds. And we finish our day with a guided tour of historic Bellvue House & Gardens, the home of Canada's first Prime Minister, Sir John A Macdonald. Round trip transportation from Toronto to the Thousand Islands and Kingston area on a deluxe highway motor coach equipped with a bathroom. A one-hour lunch cruise through the 1000 Islands. Boxed lunch on board the cruise included. Vegetarian and gluten-free options available. 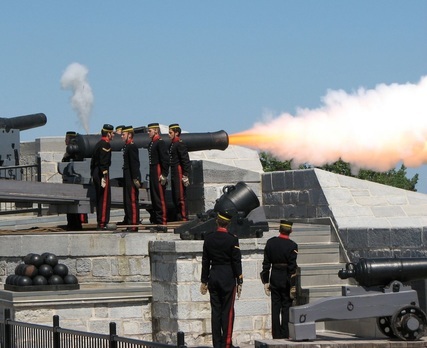 Admission and a guided tour of historic Fort Henry in Kingston, Ontario. Experience the daily Garrison Parade at the fort. Admission and guided tour by costumed tour guides dressed in period costume of historic Bellvue House & Gardens in Kingston. Brief stops along the way for breakfast and dinner. Breakfast and dinner not included in cost of tour. Cancel 7 days before departure to receive a full refund of all amounts paid. Sorry but no refunds if cancellation is less than 7 days before departure. We return to the Toronto area at approximately 9:00 PM. Experience the icons of the 1000 Islands such as Boldt Castle, the Statue of St. Lawrence, 1000 Islands International Bridge and Zavicon Islands containing the smallest International Bridge in the world, during this cruise in the heart of the 1000 Islands. Cruise past the Statue of St. Lawrence, while he watches peacefully over the moving vessels and mighty St. Lawrence River. This statue is only visible from the water, standing high above on a rock cut. Fort Henry was constructed during the war of 1812 to protect the Royal Naval Shipyard from a possible attack and to monitor traffic on the St. Lawrence. Our tour schedule today will allow us to experience the garrison parade by the squad or drums training unit, artillery detachment and goat mascot, David X who are inspected by the Officer of the Day and then go through their routines. After the parade, we will get an extensive guided tour of Fort Henry itself and you will have some free time to visit the gift shop etc. Bellevue House was once the home of Sir John A. Macdonald, Canada's first prime minister. Restored to the 1840s period, and staffed by costumed interpreters, the house and gardens are kept much as they would have been during the time that Macdonald lived here with his wife and infant son. We will be getting a guided tour of the house and gardens from costumed interpreters dressed in clothes of that era.